Because toxicity has become a way of life, and we must breath and eat, we are continuously exposed to pesticides and polluntants, some stored right under our kitchen sinks, says a report from the Silent Spring Institute in Newton, Mass., and the Harvard University School of Public Health. The study was published last October in Environmental Science & Technology, Sedona, Ariz., naturopath doctor Teresa Dale, Ph.D. says "demonstrates that we are exposed daily to a wide array of chemicals that affect our hormone systems." Chemicals like phthalates and alkyphenois may heighten the risk of hormone-linked diseases like breast cancer and testicular cancer. To limit your exposure, "read labels carefully, use nontoxic cleaning products and avoid using indoor pesticides," says Environmental Protection Agency spokesman Dave Dergan. There are nontoxic cleaning products and pesticides right in your kitchen. If you have baking soda, white vinegar, borax, and rubbing alcohol in your pantry and bathroom, you have the basic ingredients to make your own cleaning products and pesticides that don't cost you an arm and a leg. I have included formulations for making your own products from these items and many more at the end of this article. There are plenty of effective, earth-safe cleaners that you can buy or make. Using these alternatives will reduce the toxic burden in your house and environment. By switching to environmentally friendly cleaners protects your health and that of the community you live in while reducing air, water, and ground pollution. I bet you are asking yourself, "So why isn't everybody doing it?" There are very few people who actually read the labels of the products they purchase and even fewer who know the impact these chemicals can have on our bodies. Most people do not take the time or have the time to research the chemicals that go into these products. Not all "green" products are created equal, some have simply added essential oils to make it smell like the formula has changed. "You need to read the labels carefully to check for irritating chemicals, such as chlorine, ammonia and artificial fragrances and dyes," says Dharma Singh Khalsa, M.D., a preventive-medicine specialist in Tucson, Arizona. "Buy cleaners from health-food stores or retailers specializing in environmentally friendly products." "Eco-friendly cleaning and laundry products are the next frontier of environmentalism," says Marci Zaroff, former publisher of Macrocosm and CEO of Under the Canopy, an organic fabric clothing company. "It's an inexpensive, easy and effective way to protect our planet and commitment to life." * CITRUS OILl; sold in health-food stores and home improvement stores, fills rooms with the smell of oranges and is far more pleasing to your nose (unless you like the smell of hospitals). To clean or polish wood floors, dilute 1 c. of citrus oil in one gallon of hot water, and mop with a sponge. For floors that are greasy, simply use a stronger solultion. You can also clean kitchen counters and tabletops with this solution. Citrus doesn't strip the protective sealants. On porous surfaces like marble or granite, only use diluted oil and it should never be allowed to sit on a surface, always wipe it dry when finished. * TEA TREE, THYME AND LAVENDER ESSENTIAL OILS: these have been proven to have more antiseptic in some studies than phenol, the most common chemical disinfectant. Many disinfectants contain chlorine, which reacts with organix matter in drinking water to produce potentially carcinogenic trihalomethane. To make a natural disinfectant mix 20 drops of one of the above mentioned essential oils and 1 cup of water in a spray bottle. Apply and let sit for 15 min. or until dry. * BAKING SODA: Baking soda (or bicarbonate of soda), an alkaline substance is used in fire extinguishers, antacids, and sparkling water. You can use it to clean your tubs, sinks, countertops in the kitchen and bath. Combine 3/4 c. baking soda, 1/4 c. of borax and enough diswashing liquid to make a smooth paste or if you prefer a pleasant smell, add 1/4 t. lemon juice to the paste; pour down your sink drain to deorderize and to unclog your drains you put 1/2 cup of baking soda in drain and add a cup of vinegar, wait 30min. and pour hot water down drain. I use this method once a month on all the drains in the house to keep them clear. *BORAX: Borax, like is's close relative, boric acid, has relatively low toxicity levels, and is considered safe for general household use, but the powder can be harmful if ingested in sufficinet quantities by young children or pets. Keep it out of their reach. Borax is toxic to plants, so in the yard be very careful when applying borax onto or near soil. It doesn't take much to leach into the ground to kill off nearby plants and prevent furture growth. But it is great for rubbing out heavy sink stains, even rust in your stainless steel or porcelain sinks. Make a paste of 1 cup of borax and 1/4 cup of lemon juice, put some of the paste on a cloth or sponge and rub it into the stain, then rinse with running warm water, the stain should wash away with the paste. You can also remove mildew from uphostery and other fabric by soaking a sponge in a solution of 1/2 cup of borax dissolved in 2 cups of water, and rubbing it into the affected areas. Let it soak in for several hours until the stain disappears, then rinse well. To remove mildew from clothing, soak it in a solution of 2 cups of borax in 2 quarts of water. Want a way to clean your toliet bowl and leave it spakeling whiite without those dangerous fumes? Use a stiff brush to scrub it using a solution of 1/2 cup of borax mixed with a gallon of water. VINEGAR: Vinegar is known as nature's most practical liquid and is so versatile that you can use it in the kitchen and bath, laundry and garden, housecleaning and car cleaning, even pet care and personal care. Damp mopping with a mild vinegar solution is widely recommended as a way to clean wood and no-wax vinyl or laminate flooring. Be sure to check with the manufacturer of the flooring because even when diluted vinegar's acidity can ruin some floor finishes, and too much water will damage most wooden floors. But if you want to try vinegar on your floors, use 1/2 cup white vinegar mixed in 1 gallon warm water. You may want to start with a trial application in an incomspicuous area. Before applying the solution, squeeze out the mop sthoroughly (or just use a spray bottle to moisten the mop head). To liven up dull wood paneling, mix 2 cups warm water, 4 tablespoons white or cider vinegar, and 2 tablespoons olive oil in a container, give it a couple of shakes and apply with a clean cloth. Let it soak in for several minutes, then polish with a dry cloth. To keep your computer, printer, and other home office gear clean and dust free, dampen a clean cloth in equal parts white viegar and water, sqeeze it out well and start wiping. Before you start, make sure that your equipment is shut off, and never use a spray bottle; you don't want to get liquid on the circuis inside. Have a few cotton swabs on hand for getting into tight spaces (like between the keys of your keyboard). To make a scratch on a wooden tabletop much less noticeable, mix some distilled or cider vinegar and iodine in a small jar and paint over the scratch with a small artist's brush. Use more iodine for darker woods; more vinegar for lighter shades. To remove white rings left by wet glasses on wood furniture, mix equal parts of vinegar and olive oil and apply it with a soft cloth while moving with the wood grain. Use another clean, soft cloth to shine it. To get white water rings off leather furniture, dab them with a sponge soaked in full-strength white vinegar. For the great outdoors, vinegar can get rid of bugs and ants or you can use it as an insect repellent and clean you outdoor funiture and decks. Pour equal parts white vinegar and water into a spray bottle and spray it on anthills and around areas where you see ants. Ants hate vinegar, and it won't take long for them to move on. Also, you can spray picnic and children's play areas to keep ants away. If you have lots of anthills, pour full strength vinegar over them. Going camping or fishing? Here's an old army trick to keep away ticks and mosquitoes: About three days before you leave, start taking 1 tablespoon cider vinegar three times a day. Continue throughout your outing and you just might return home without a bite. Before resorting to bleach to remove mildew on your deck or your patio furniture, try these milder vinegar-based solutions. *Keep full-strength white vinegar in a spray bottle and use it wherever you see mildew. The stain will wipe right off must surfaces, and the vinegar will keep it from coming back for a while. *Remove mildew from wood decks and wood patio furniture by sponging them off with a solution of 1 cup ammonia, 1/2 cup white vinegar, and 1/4 cup baking soda in 1 gallon water. Use an old tootbrush to work the solution into tight spaces. *To deodorize and inhibit mildew growth on outdoor plastic mesh furniture and patio umbrellas, mix 2 cups white vinegar and 2 tablespoons dishwashing liquid in a bucket of hot water. Use a soft brush to work it into the grooves of the plastic and for scrubbing seat pands and umbrella fabric. Rinse with cold water; then dry in the sun. RUBBING ALCOHOL: Be sure to not confuse denatured alcohol with rubbing alcohol. Denatured alcohol to ethanol (drinking alcohol) to which poisonous and foul-tasting chemicals have been added to render it unfit for drinking. 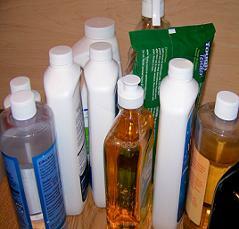 Often, the chemicals used in denatured alcohol are not ones you should put on your skin. Rubbing alcohol is made of chemicals that are safe for skin contact, most often it's 70 percent isopropl alcohol and 30 percent water. Ticks hate the taste of rubbing alcohol as much as they love the taste of your dog. Before you pull a tick off Fido, dab the critter with rubbing alcohol to make it loosen its grip. Then grab the tick as close to the dog's skin as ou can and pull it straight out. Dab again with alcohol to disinfect the wound. This works on people too. The problem with ice packs is they won't conform to the shape of the injured body part. Make a slushy conformable pack by nixing 1 part rubbing alcohol with 3 parts water in a sel-closing plastic bag. The next time that sore knee acts up, wrap the bag of slush in a cloth and apply it to the area. This is just the tip of iceberg of ways to use eco-friendly products that you can make yourself. I have used most of these recipes for the past 10 years. They cost next to nothing to make and the results are fabulous. I use olive oil and vinegar to clean my furniture and I don't have to dust again for a month. The solution seems to repel dust, just mix the olive oil and vinegar like you would for a salad dressing.